The lights are low, the volume's up, and a great film is playing on the big screen -- you can't go wrong with a movie night. However, a trip to the movie theater can be expensive, they're not always showing something you want to see, and you have to leave the comfort of your own home. 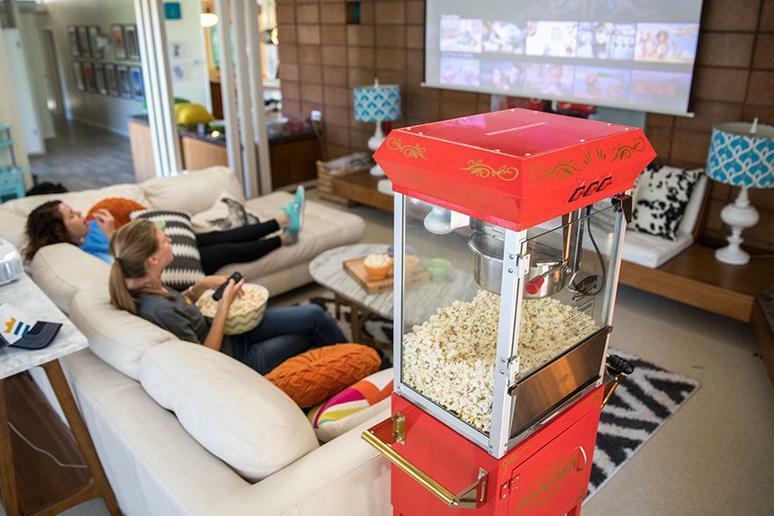 Sometimes, a home movie night is the superior option, but what makes a great one? A big TV: You might still be able to have a fun time watching a movie on a tiny 20-inch screen, but it won't rival a trip to the cinema. If you're serious about hosting movie nights -- or just watching a large number of movies in general -- opt for the biggest television you can afford without sacrificing picture quality. An excellent movie: You might have all the best equipment, but if the only movies you own are Deck the Halls and Dirty Grandpa, you've run into a problem. Today, the majority of people use subscription services or buy films digitally, but if DVDs are your bag, that's fine, too. You might want to watch a new release or a classic picture -- the beauty of a movie night is that the choice is yours. Tasty movie snacks: Let's face it, the snacks alone are what draw people to the movie theater, but you can eat classic movie theater snacks in your living room. Popcorn, red vines, nachos... the culinary world is your oyster (though oysters aren't great movie snacks).